A freehold property at Dalvey Road – Villa D’Este is the latest condominium to leap into the buoyant en bloc market, with a price tag of S$96 million. The condo in prime District 10 comprises a total of 12 apartments, with sizes ranging from 3,465 to 3,939 square feet (sq ft) and 10 out of the 12 home owners (83%) have given their consent for the collective sale to proceed. Based on estimates, the asking price will work out to be approximate S$1,730 psf for the site area of about 55,480 sq ft. Development charges are not applicable in this case. With the asking price, each home owner will stand to pocket around S$7.5 million to S$8 million from this en bloc sale. 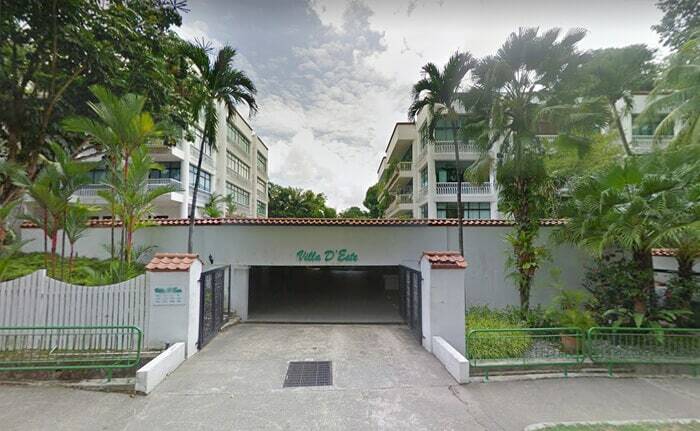 Villa D’Este was previously being put up for en bloc sale back in 2010 for a higher price of S$115 million, however, there weren’t any buyers at that point of time – which was also when the government started to roll out property cooling measures. According to the Urban Redevelopment Authority (URA) Master Plan 2014, the Villa D’Este site has been zoned for residential development within a good class bungalow (GCB) area. Property consultants mentioned that the site can be either redeveloped into 1 to 3 GCBs or a small development with around 24 units – with approximately 2,000 sq ft each, based on a total gross floor area of more than 49,000 sq ft. The en bloc sale market has been steamrolling ahead with a total value $1.5 billion from the 4 deals concluded this year, with Eunosville being the most eye-catching one among the rest. Villa D’Este will join the list of properties which have also been put up for collective sale in the last couple of months, such as Serangoon Ville at Serangoon North Avenue 1, Tampines Court at Tampines Street 11 and Albracca along Meyer Road. The tender for Villa D’Este will close on 25 August 2017.